The project, led by Shep Doeleman, an astronomer at the Harvard-Smithsonian Center for Astrophysics, was the work of more than 200 researchers. About 40 of them were women, according to Harvard's Black Hole Initiative. "There are women involved in every single step of this amazing project," said Sara Issaoun, 24, a graduate student at Radboud University in the Netherlands who worked on the research. "As a woman in STEM myself, it's good to have role models out there who young girls and young boys can look up to." But Issaoun warned against a "lone-wolf success" narrative. "The diversity and group effort and the breadth of our collaboration, I think, is worth celebration," she said. To capture the image of a black hole - a mysterious phenomenon long thought to be unseeable - the scientists used eight radio observatories across the globe to observe the galaxy on and off for 10 days in April 2017. Then they embarked on the painstaking effort to process enormous amounts of data and map it into an image. After the burst of publicity spread her smiling face across Twitter, Facebook, Reddit and news sites around the globe, Bouman did not initially respond to requests for comment Thursday. In a Facebook post, she said: "No one algorithm or person made this image. It required the amazing talent of a team of scientists from around the globe." In a text message late Thursday night, Bouman said that she had to turn her phone off because she was getting so many messages. "I'm so glad that everyone is as excited as we are and people are finding our story inspirational," she wrote. "However, the spotlight should be on the team and no individual person. Focusing on one person like this helps no one, including me." "Honestly, it was a dream come true," Sandra Bustamante, a telescope instrumentalist who worked on the project, said in an interview this week. Feryal Ozel, an astronomy and astrophysics professor at the University of Arizona who was on the science council for the project, first published a paper on black hole imaging in 2000. She called the unveiling "a sweet moment that's been a long time in the making." In an interview Thursday, Ozel said that it was exciting to see people interested in the role of women in science, but she highlighted the contributions of other women and men. That included one of her male graduate students, who took multiple trips to the South Pole, where one of the telescopes was located. "I think giving credit to any single individual - whether this is a woman or man, young or old - harms the collaboration," she said. Penn Sheppard, who works with Girls Inc., an organization that empowers young women and offers after-school programming to support girls learning in science, technology, engineering and math, said Bouman's story resonated in an industry in which women are underrepresented - and in a world in which their scientific contributions have historically gone unacknowledged. "It was an opportunity to see an accomplished woman play a significant role, and being acknowledged in that role," she said. "That's significant because girls and young boys are starting to see that women are scientists - not just you can be, but you are." 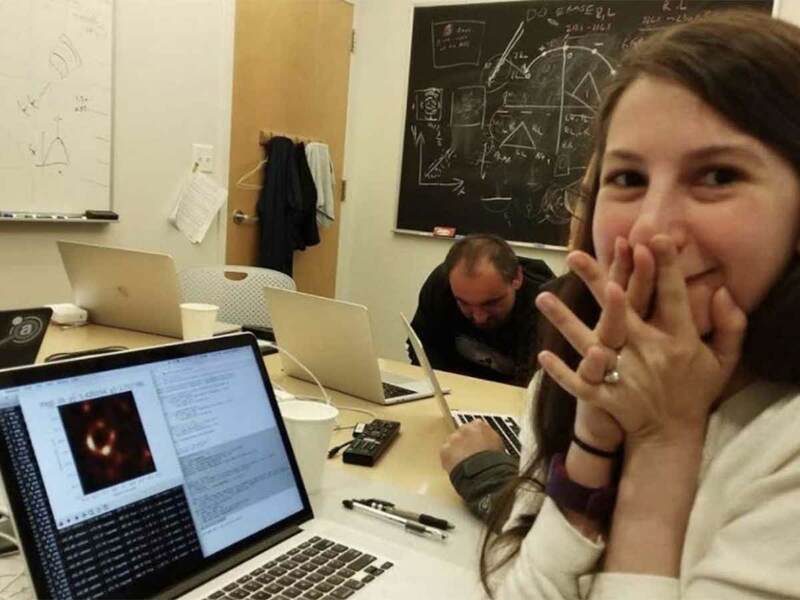 "We love this photo too, because she looks so happy," said Issaoun, who said she got shivers when she saw the image of a black hole. "I think her expression really captures how we all felt when we first saw it."